Yesterday I had the lovely experience of time-travel, only the gate I passed through did not take me to some imaginary historical moment or gauzy future, but rather to my own past. 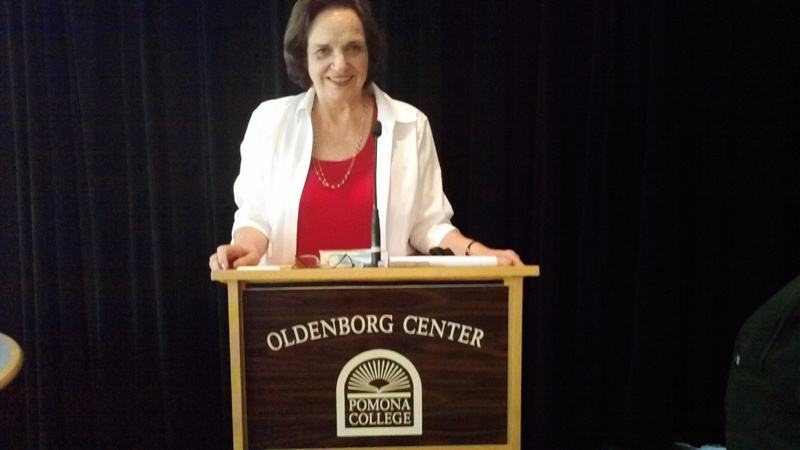 A classmate who came to hear me address the students of my alma mater, Pomona College, had the experience, too. He saw me on the street and said, “ah, there’s Jo Wallace,” a person I used to be a long time ago. So, through that long lens of time I got to revisit a place, with all its sensations, I used to live in decades in the past, and share it with others who were there, including my favorite French professor, Leonard Pronko, and many others who were not. The bond we had, and the affection we shared, centered on Paris and its delights, the eternal allure of France and all its seductions. I also got to experience time travel of another sort by reading the opening pages of my novel, That Paris Year, and discussing them with a large group of students — just like the narrator J.J. comes to discuss Paris with a group of students in those same pages. Although it was assumed that I am in fact J.J., and therefore I had really done this before, the truth – stranger than fiction – is that I am not that fictional character. Nor had I ever addressed that audience about France before. So it was a delicious moment of life imitating art, or perhaps the other way around? Time travel, where all the niggling boundaries between reality and un-, fact and fiction, here and there, melt away. If you’ve not gone there, get your passport now. Coming out July 12. Click to it !